Lego's Harry Potter range of toys constantly amaze me. They are all relatively cheap for what you receive, and they are all really well designed. Slytherin House comes equipped with a whole heap of extra gadgets including wands, a goblet, an owl, snakes, a shield, a scroll and a pot. 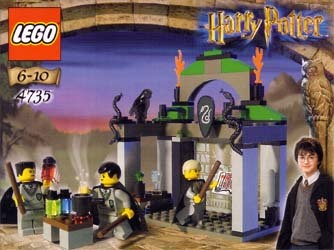 It also comes complete with three Lego figures (Harry/Crabbe, Ron/Goyle and Draco Malfoy). The great thing about this set is that you can change Harry and Ron into Crabbe and Goyle by simply changing their hair and, in Harry's case, turning the head around. This set can be played with on its own, or with other sets in the range. But, if you are just starting out on your collection, there are instructions for two other designs you can constructed from this kit. Another very entertaining and affordable set from Lego.